For me, that’s it—or at least a big part of where the Leafs are "at". We all keep acknowledging and saying, this team is better. And it is. But better, of course, is a relative term. Better than what we have had in the last five or so seasons? Sure. Better as in, we’re now good enough to challenge for something serious? I’m not so certain about that. And Gerund O’ touched on—and said better than I can—the one thing that we may be missing is a player with that kind of drive....with....unrelenting competitiveness. But I’ll take it even a step further. (I’m guessing Gerund would, too.) We could use a team mentality that pushes it—everyone on the team— to play with “unrelenting competitiveness”. I’ve talked here a lot recently about what I perceive as the lack of overall Leaf team toughness. Oh, the team plays pretty hard most nights. And there are some guys who hit (Phaneuf, Schenn, Brown on occasion, Kulemin when there is an eclipse…) and guys who will drop the gloves (Rosehill, Brown) but what I’m talking about is having guys who are really and truly hard to play against- and consistently so. 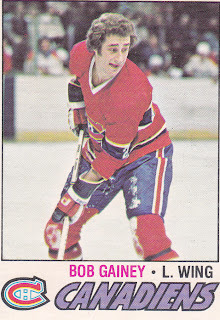 I always go back to someone like Bob Gainey in the ‘70s and ‘80s. He rarely scored 20 goals a season, but my God, when you played against Gainey you knew you had been in a hockey game. He would lay you out (cleanly), rattle your bones, fight for every puck, make the simple, smart plays. He could skate like the wind, was so hard on the puck and so good defensively that they created the Selke Trophy largely because of him. 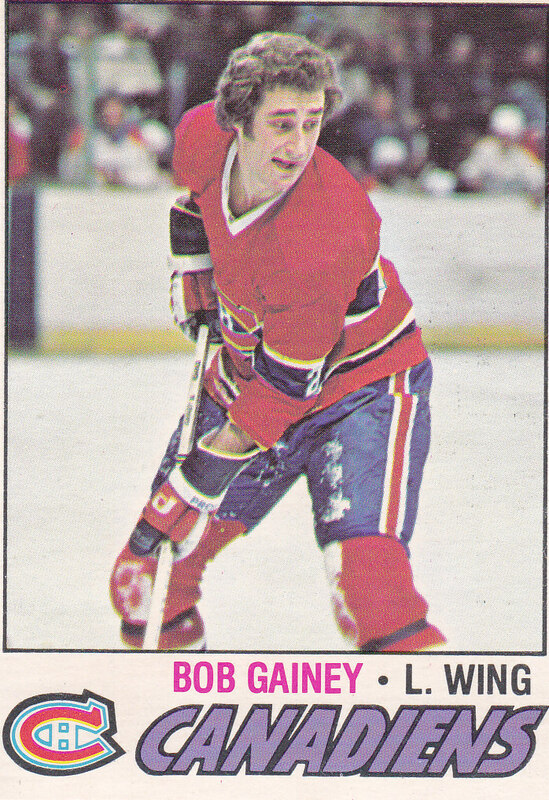 I remember closely watching (when I spent a lot of time at the Gardens watching the Leaf in those days) his 1970s battles with Lanny McDonald. And they were indeed battles. Two proud, determined players, neither of whom wanted to give an inch. Those were great nights to be a hockey fan, watching two future Hall-of-Famers in action, going toe to toe. In more recent times, we saw it in the way the Devils checked ferociously, led by players such as the always easy-to-hate Claude Lemiux and John MacLean, among many others. And of course there was Scott Stevens and friends on the back line, who kept the opposition alert. Same with the Avalanche. Forsberg wasn’t just good, he wasn’t afraid to leave a piece of his wooden stick on you in you?) to create a bit of space for himself. Ditto Adam Foote. And it was also exemplified by a "third line" like Draper, Maltby and McCarthy in Detroit. That was like playing against a buzz-saw. You had to be ready and if you weren’t, you were going to lose. In short, it's about a guy (or guys) who played every shift with passion, like they were on fire and the only way to put it out was to play with every ounce of energy that they had and sweat it out. That’s what I’m talking about- and looking for. Kessel and Lupul? Wonderfully gifted offensive players. And we keep hearing that Kessel is becoming a better all-around player, more defensively conscious. And from what I am seeing, I think that’s true, to an extent. He is, as Don Cherry pointed out the other night, also taking a fair bit of abuse from the opposition, and not surprisingly so. They know that he can’t/won’t do anything about it except complain to the refs. And, he doesn’t have many teammates who will do much about it, either. As for Lupul, we’ll need to see more of his offensive skills and intensity on display in his own zone. As we all know, what you do there is just as important as what you do at the other end of the ice. It’s not much good if you score (or set up) a beautiful goal every night but you are standing around while the guy you’re covering pots two. So that’s my soliloquy for the day. No thorough assessment of the good and the bad. Simply expressing my sense, that, if the Leafs are going to go anywhere and keep building on the team that Burke has assembled (one with, as we all keep saying, speed, youth and depth) they will also need to either add—or develop—the character/”winner” quotient. Whether they already have it in the dressing room and it just needs to develop or they need to acquire it, I’m not so sure. But it’s a key next-step ingredient, and if they don’t get it, they can amass all the "talent", all the Marian Hossas’ and Ilya Kovalchuks’ in the world, but it won't be enough. Until they have the Bobby Pulford-type, a tough, 1960s grinding forward with the Leafs when they were Cup winners, my guess is they will ultimately fall short. 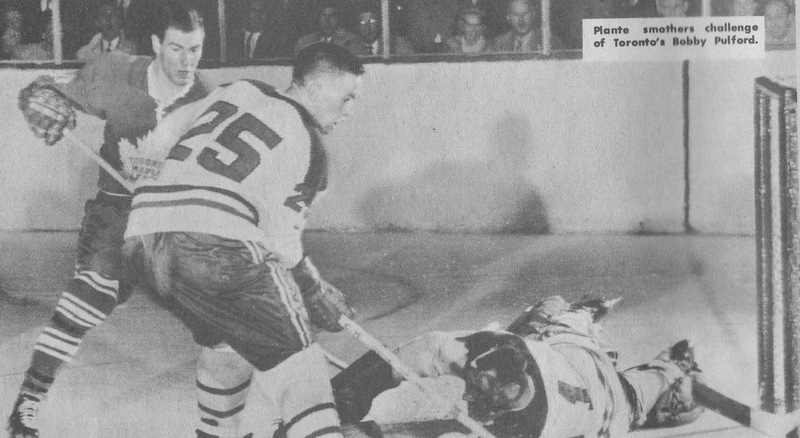 (That's Pulford on the right, battling for the puck in the crease, in early '60s game-action at the Gardens against a very young Terry Harper and Montreal's future Hall-of-Fame goaltender Jacques Plante...) It can be a Pulford, or a Bobby Clarke, a Larry Robinson, a Terry O’Reilly, or maybe a Doug Risebrough, Bryan Trottier, Esa Tikkanen, Kris Draper, Rod Brind’Amour, etc… But it's got to be somebody, and it's got to be a team-wide attitude. Otherwise, we’ll end up watching the Leafs come playoff time and saying, “hey we’re so much better than we were, but....ah....what just happened...”. And what will have happened is that a team with the same amount of, or perhaps even less talent, but who wanted it a lot more, will have just taken our guys out. I just nodded my head through this whole post. I couldn't agree more!!! It's what another terrific VLM'er, Bobby Craig, called "muckulence", but it's no-quit muckulence! It was painfully evident during the last two games - games we should have won - that we don't have it. When players are taking liberties with Kessel, or Phaneuf, or Gustavsson, and no one does anything; when the opposing D don't hurry up when they see our forecheckers coming; when every shift isn't being played as if the game depends on it, then there's no way we're going to contend for a Cup. It's what we call "playoff hockey" - and too often the Leafs are guilty of playing "lay-off hockey". When I look at our personnel, I can't believe we're struggling to make 8th. Is St Louis that much better than we are? Yet their win percentage since Hitchcock took over is what - over .600? Ottawa reels off win after win - you can't tell me they're better on paper than we are. But you can tell me that, as a team, they're both playing harder than we are. So - I applaud the sentiment, Michael! As I watched the whole team look out of sync on Saturday, I started to get that old sinking feeling you allude to at the end of your post. I hope we'll be proven wrong! I will second what Gerund and Michael have clearly articulated. What is needed goes beyond muckulence, this no quit, drive, determination and hockey “sixth sense” exhibited by those difference makers like Bob Gainey and Claude Lemieux. Even Wayne Gretzky, who we are not likely to associate with the aforementioned grinding players would not stay in second or third gear, but shift into overdrive when winning or losing a key game was on the table. As disillusioned as I am with these past few games, and just how this deficiency has become glaringly evident, I still think we can take a “glass half full” approach to the situation at hand. While I could not argue that a key addition will be required to find a Gary Roberts-Bob Gainey-Claude Lemieux-Doug Gilmour, no quit type player, Gainey could not do it all on his own. You need players that feed off and elevate their level of competition in the aura of those exemplary leaders. I would include in that group Daryl Boyce and Dave Brown; however, I see it throughout the lineup. This is not a team that exhibits a lack of concern. It is a team that lacks a small but vital component, a missing element that is frustrating everyone at the moment. Could it be waiting within the current lineup? This is a young team, and I see it in embryonic form in several players. However, it may be necessary to import such an element in the short term, to allow that mind-set to cultivate within. Dare we say that this team not only needs physical toughness but also mental toughness...as evidence in the last 4 loses. I believe its time for Burkie to look into the possibly of acquiring a speedy player with good skill set that plays the game hard. The one I have in mind is Tuomo Ruutu. He could be a fit for Lupul and Kessel. Another great (and very relevant) topic, Michael. Love the term "muckulence" coined by your insightful readers...very aptly describes the buds of the last few years. I really don't know what the answer to this perceived lack of team toughness is. Maybe it gets back to Burke's incessant (and justifiable) complaints of entitlement. Until they can figure it out, one can only look back with fondness. I'm a bit younger (immigrated to Canada in the mid '80s from a non-hockey country), so memories are more recent. But I clearly remember players doing 'something' about incidents like Kessel, Dion, Lupul, etc. being pushed around. Though I don’t remember the circumstances, I vividly recall Daniel Marois dropping the gloves with Scott Stevens, of all people. Another time, I recall Mike Gartner go to the aid of a teammate because he thought an opponent was ‘hitting him when he was down.’ Of course there was Wendel vs McSorley in the playoffs, but the first 2 are examples of players going beyond their roles. I’m not a big fan of the fights as they are today, and not suggesting that’s what should be done, but those little shoves and slashes shouldn’t go unanswered, that’s all. On the other hand, I can safely say that this is also the case with several other teams (including a few playoff bound teams). Thanks Gerund O'...you inspired this post, for sure. And I fully agree. As I've posted here often, the Leafs should absolutely be in the playoffs, given who they are competing with in the Eastern Conference. Bobby C...very well said. Like you, I'm wondering if what is "needed" already exists within the group- or if someone from the "outside" can come in and truly ignite things. We'll see, I guess. Caedmon. I'm very glad you have landed here and that you have joined the tremendous (and thoughtful) posters here. I love that you remember those specific incidents (Marois and Gartner) involving Leafs who weren't "tough" guys but who saw that something needed to be done, and just did it because someone had to do it.